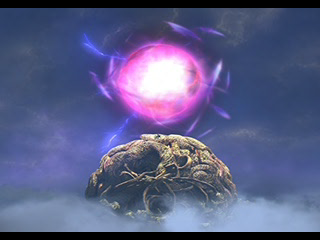 You'll trigger the events leading into Memoria upon approaching the massive, purple orb floating above the Iifa Tree. You'll also wind up fighting a boss to gain entry. Seems familiar, don't it? Nova Dragon is like most dragons you've fought in Final Fantasy IX in that it loves wind-based attacks, and will hit one or all of your party members with some fairly stunning wind strikes. You can therefore buffer or negate most of its attacks with Ribbons, Coronets, Robes of Lords, or anything else you have that might interfere with gusty pain. That leaves only the all-hitting Shockwave to worry about, as well as counters to your physical attacks. Smack Nova Dragon around with your most powerful non-physical attacks in the meantime, tending towards ice if you have Vivi in the party. All in all, not too difficult. Zidane can Steal a Remedy, a Dragon Wrist, and some Grand Armor from the Nova Dragon. - Head north. On the next screen you'll find your first save point that is not a Moogle. You can swap your party at these points, as well. The monsters from this moment on are pretty brutal, so you should save whenever you get the chance. It's also wise to equip Abilities that protect against status ailments, as they're rife in this dungeon. - One screen north of the save point you'll find a spiral staircase wrapping around a pendulum. Check to the left of the entrance and you'll find a question mark with seemingly no purpose; challenge it to a card game and you'll find the phantom of a Tetra Master expert who will happily take you on. He has a lot of rare cards worth getting. - Keep walking. The path looks cool, but is pretty straightforward. On the next screen you'll wind up climbing through ruins covered in ornate windows; keep your eyes open for a small balcony near the top. Check inside for a hidden The Tower. On the next screen you'll find a long, curving bridge, and as you head towards the end of the bridge you'll be challenged by a familiar face. Didn't get to fight her before, so now's your chance. Maliris is a powerful melee combatant, combining her sword skills with fire to smack your party around. Her most powerful move is Flame Slash, which hits one person for around 3,000 HP (though it's dependent on their magic defence) and often knocking your characters out. She also likes Mustard Bomb, which stands a good chance of inflict heat status on one character, and will use Reflect often to make casting spells a problem. 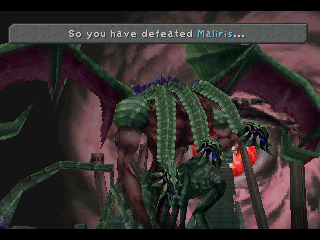 Fortunately, Maliris doesn't have any all-hitting attacks, and so long as you have one healer it shouldn't be that difficult to bring her down. Ice and water, unsurprisingly, work rather well here, and you can bypass Reflect either by Reflecting yourself and bouncing spells off your party members or using Steiner's Blizzaga Sword. Just be warned: Maliris will use her Sword Rain AOE attack on everybody once she runs through her just-below-60,000 HP as a parting gift, doing around 2,000 points of damage to each character. Be healed up before this happens. Zidane can Steal Genji Armor, an Ultima Sword, and a Masamune from Maliris. - There's a cut scene in the next room, in front of a grave stone. Check the left side of the grave stone for an Angel Flute, and check the right for a hidden save point. Then carry on east. Carry on until you're in a demolished tower and surrounded by rain. If you check the far-left side of the screen you'll find another hidden Tetra Master player. 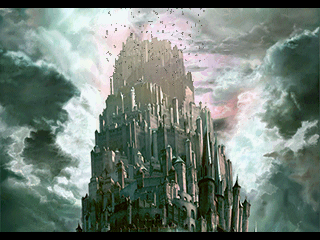 - Up the next set of stairs is another cut scene, and beyond some stairs into an all-too-familiar eyeball in the sky. Check the left side of the lower platform for hidden Rune Claws, then start climbing. Just before you ht the eye you'll run into another without-warning boss battle. The second of the Fiends is a bit easier than his predecessor, but not by much. Tiamat is another windy dragon, and he likes to use Twister to hit your whole party for wind damage - easily negated by Coronets, Robes of Lords, etc. - and Silent Claw, which is just plain painful for one party member. But he's also rather tricksy, and will steal your Attack and Magic power away, along with your MP, to prolong the fight. Every rare now and then Tiamat will also use his annoying Jetfire attack to inflict heat status on your entire party, which, hopefully, you've negated with Body Temp. Last, Tiamat will cast Float on your party members, and anyone who attacks the dragon with Float active will get Snorted out of the battle. Ouch. Unless you're keen on grabbing Tiamat's equipment, which isn't that great, it's key to get this battle over with as quickly as possible. Use your most powerful attacks, preferably with a hint of ice, to rip through Timata's health before it can cause too much trouble. Don't worry too much about healing unless one or two of your party members goes down. You can expedite this process by using Silence on Tiamat, negating the threat of Float / Snort. Not too horrible overall. 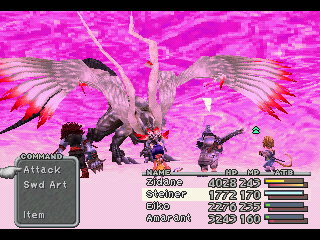 Zidane can Steal a Blood Sword, Feather Boots, and a Grand Helm from Tiamat. - Keep going. The next area is shaded pink, and that continues to the next screen over. When you descend a set of stairs you'll see barrels on your right; here you'll find yet another phantasmal Tetra Master opponent. Continue along the path to the west and it twists, and inside a topsy-turvy castle structure you'll find a save point waiting. - The next area is underwater. The path looks straight, but if you hunt around behind the rocks on your right and keep pressing X you'll run into a seemingly disembodied voice. Refuse to leave and you'll get into a battle. This dude ain't kidding around. 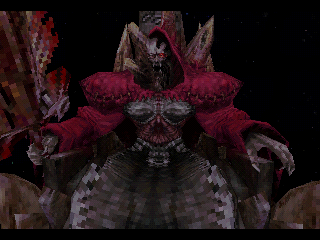 Originally pegged as the final boss of Final Fantasy IX, Hades is incredibly powerful. He uses his enormous sword to target your party physically, either hitting everyone for roughly 2,000 apiece with Cleave or knocking a single party member down to one HP with Judgment Sword. He can also power his sword up and use Curse after several turns, harming your party and dousing them with almost every status ailment in the book, and will also charge up to use Doomsday, which hits everyone hard - while healing Hades. Also, he can inflict freeze and heat status on your members, because he's a jerk. Ouch. Get this battle over with quickly, if you can. Your healer should be using Curaga most turns to restore everyone's health after Cleave while the rest of the party mashes Hades with physical attacks. He is both demon and aerial, so Devil and Bird Killer work nicely as Abilities. You'll also want to equip as many status-ignoring Abilities as you can, namely Body Temp, Antibody, Bright Eyes, and Clear Headed. This will make Curse much less dangerous. Have Remedies on hand if anyone doesn't have those Abilities equipped. Equipment that either negates or absorbs shadow damage (Ninja Gear, Egoist's Armlets, Demon Mail, etc.) are recommended for staving off the damage from Doomsday. Zidane can Steal a Reflect Ring, Running Shoes, Battles Boots, and a Robe of Lords from Hades. I recommend being veeeery high level if you want to go for that super-rare Robe of Lords. Defeating Hades will also become the game's greatest Synthesis Shop after he's defeated, and can create some truly awesome items - assuming you have the components. - I recommend heading back a screen and saving after defeating Hades. There's another boss coming up, and this one is not optional. 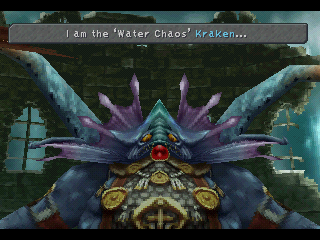 Perhaps the weakest of the Fiends, Kraken is still pretty annoying. It actually consists of three parts - main body, Left Tentacle, Right Tentacle - and all three can attack. The two Tentacles can use a water attack and an ink attack, neither particularly dangerous, while the main body can inflict freeze status on a character and use Waterga to hit everyone in your party. Defeat the two Tentacles and Kraken will start using a more powerful physical move, which more or less defeats the point of taking them out. So long as you have Body Temp equipped Kraken is not particularly difficult. Smash it down with normal physical attacks and, if you have the chance, use lightning magic and abilities to whittle away its health. So long as you don't accidentally Reflect or otherwise return water damage back to the beast it won't last very long under a sustained assault. Zidane can Steal a Genji Helmet, a Wizard's Rod, and a Glutton's Robe from Kraken. Hey heeeeey, finally, one you've fought before. Lich is a bit different from Earth Guardian, and though it retains its love of the Earthquake spell Lich's primary focus is on instant kill moves. Most of them you can't do anything about besides revive anyone who dies, though one, Lvl. 5 Death, can be countered simply by not having anyone in your party whose level is divisible by five. Lich can also use Stop, which is annoying, though not horrific. 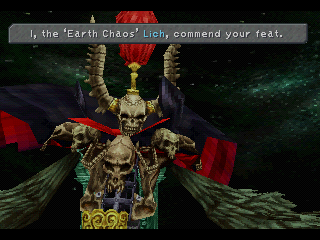 Lich doesn't have great defences, so normal physical attacks work nicely in this battle, as does fire magic. (Despite how it looks, though, Lich is not undead, so don't try curative magic or items.) You can also make healing and attacking easier by using Slow on Lich to increase the time between its attacks. Slap Locomotion on your team members to negate the effects of Stop and Bird Killer to take advantage of Lich's floaty nature. Keep on slapping it around and, sooner or later, Lich will collapse and die. Zidane can Steal Genji Gloves, a Siren's Flute, and Black Robes from Lich. - Explore the platform after defeating Lich. Up and to your left you'll find yet another hidden save point, and on your right you'll see an intact pillar that, under normal circumstances, is just part of the scenery. 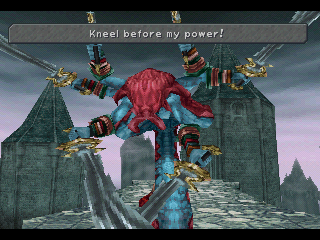 If, however, you manage to get to this point in the game in under twelve hours - no mean feat, and probably impossible if you're playing for your first time - you'll find a note on the pillar, and beside it the Excalibur II, Steiner's best weapon in the game. - Step out into the abyss and walk up. After a cut scene you'll reach a new location: the Crystal World, the final area of the game.